The November Giveaway is over! All a reader had to do to enter this Giveaway with the winner selected by random drawing was leave a comment with an email address--written out, not as a hot link--on any post I wrote. I blog here on SlingWords as well as on Smart Girls Read Romance, Gems in the Attic, and The Authors Billboard. A comment with an email on any of my posts on those 4 blogs qualified. I'm late making the announcement of the winners because I was called away from home. My notes about those who entered were in my office at home. Cathy S. who commented here on SlingWords and Donna D. who commented on one of my posts on Smart Girls Read Romance. The December Giveaway will be announced December 1 so be sure and visit my blog or subscribe to my mailing list. Amazon Author Page * BookBub Author Page * Facebook Fan Page * Twitter * YouTube * Joan's Website. 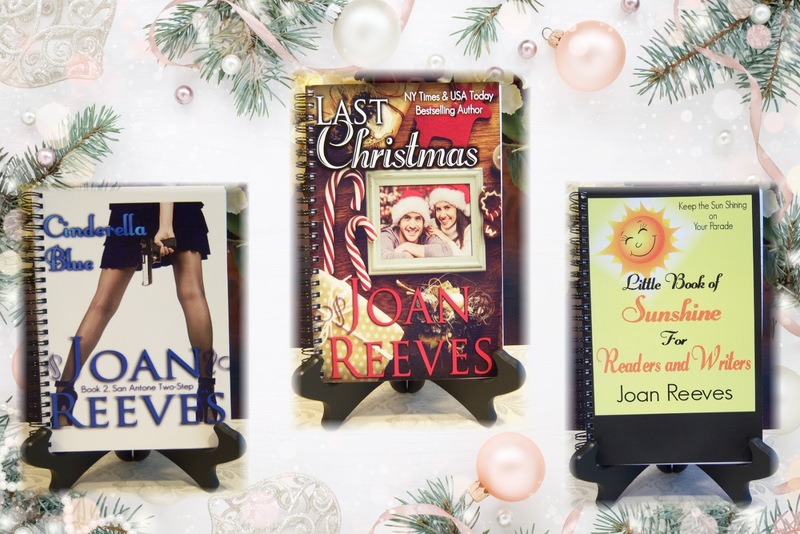 Be the first to know about New Books and Giveaways, sign up for Joan's Mailing List. Audio Books make a commute time well spent. He needed a wife, but he didn't have his ex in mind for the job. Is there such a thing as a Forever Love? If you can't give in to insanity at New Year's, when can you? She's the twon Good Girl. He's a former jock who's had too many women. He has Rules for Romance. She breaks every rule. An attitude adjustment disguised as a book. At Amazon & Other Ebook Sellers. Featured: Ringer Tee "Writers Write. Everyone else makes excuses." You've probably seen PayPal "Buy me a Cup of Coffee" buttons for reader donations. A Cup of Coffee is nice, but buying an author's book is even nicer. If you want to thank JOAN for helping you, buy one of her books. Leave a review & you'll have her thanks & affection!. Even though my name is not Paige Turner, I'm a NY Times and USA Today bestselling author of Contemporary Romance. You can find my books in audio, ebook, and print with several of my romances in French from MILADY Romance (Bragelonne), my French publisher. I live my happily ever after in Texas with my hero, my husband. Joan Reeves is a participant in the Amazon Services LLC Associates Program, an affiliate advertising program designed to provide a means for sites to earn advertising fees by advertising and linking to amazon.com. Joan Reeves is also a participant in the affiliate advertising programs offered by All Romance eBooks, Audible, Barnes & Noble, iTunes, KoboBooks, and Smashwords which are designed to provide a means for sites to earn advertising fees by advertising and linking to the respective websites. For more information, please see the Ad Policy Page on the Blog. Content Copyright 2005-2018 by Joan Reeves. Picture Window theme. Theme images by konradlew. Powered by Blogger.